In 1845, the Midland Railway, formed only a year earlier, outflanked and outbid the Great Western Railway for the purchase of the Birmingham & Gloucester and Bristol & Gloucester railways, who themselves had just agreed to amalgamate as the Birmingham & Bristol Railway. As a result, the railway map of Gloucestershire was to have a Midland red spine, with an important and busy main line running through the county from Ashchurch in the north to Yate in the south and with numerous branches breaking off from it. It also served to turn Gloucester in to one of the country’s great railway centres of the steam age, where the Midland had a separate station, goods yards, dock system and locomotive shed. Having originally intended to cover all of these lines in one volume, the sheer variety, quality and number of images collected has dictated that this major study in colour of the Midland lines in Gloucestershire has had to be split in two. Part 1 begins therefore in the north at Defford, just over the county boundary in Worcestershire, from where we head south to the magnificent architectural gem that was Ashchurch station. Here, we alight to travel the two branches heading off east and west: eastwards, to the Midland station at Evesham, was part of a double-track line that formed a secondary route to Birmingham, via Redditch and Barnt Green, but which was in its final years in the pictures that show it here; meanwhile, that to the west had originally run to Malvern but had been cut back to terminate at Upton-on-Severn in 1952. Back on the main line, the journey then is south through Cleeve, Cheltenham Lansdown and Churchdown, to reach the Midland station at Gloucester, renamed Eastgate by British Railways in 1951. 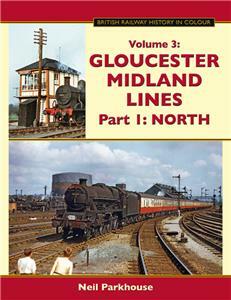 There is a visit to the locomotive sheds at Barnwood on the way and coverage of the Midland goods yard at Gloucester. In the third volume of this remarkable colour series, author Neil Parkhouse presents another exciting and extensive collection of pictures, which are again further illuminated with maps, tickets, WTT extracts and other ephemera of the period. Those who knew the lines featured will delight in how they have been brought back to life within these pages, as so very little of what is depicted remains today. Barnwood shed closed in 1964 and Eastgate in 1975; both sites have since been redeveloped, with that of Eastgate completely lost beneath a superstore. So sit back and enjoy the hustle and bustle of this once busy station, or the variety of workings passing through Hatherley and Churchdown, or wait for the very occasional branch trains at Ripple and Beckford. And delight in the colour of it all!